Build Volume: 4.7 x 4.7 x 4.7"
Experience the functionality of a 3D printer in a compact form factor with the da Vinci nano 3D Printer from XYZprinting. Print with PLA and PETG filaments up to a maximum build volume of 4.7 x 4.7 x 4.7" with a printing speed of up to 70 mm/s. Create detailed objects in resolutions as fine as 100 microns or print faster with 300 microns. The XYZmaker software is a free entry-level 3D printing software you can use to print STL, 3W, NKG, and 3MF file formats. Send your completed designs to the printer via the USB 2.0 cable. The da Vinci nano's build plate calibrates automatically and is located in an enclosed printing area that protects users from hot machinery during printing, although the print bed itself is not heated. 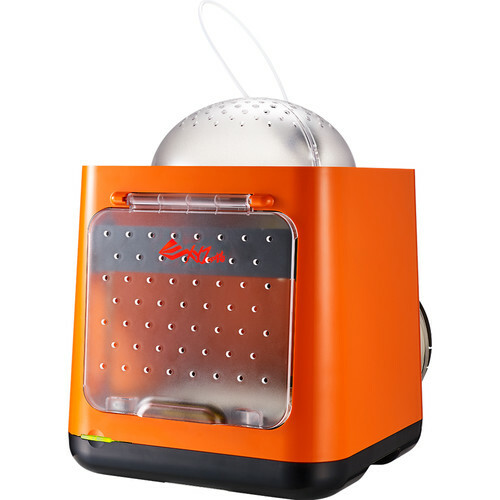 The da Vinci nano features a compact and lightweight design, weighing just 10 pounds. It has a 4.7 x 4.7 x 4.7" build area. The da Vinci nano is safe for children, thanks to the enclosed build chamber. After your 3D print is ready, you can easily remove it by taking out the removable build plate. The da Vinci nano uses PLA filaments that are made with corn starch, sugarcane, and other natural materials, making it bio-compostable. It is safe to print and for the environment. Box Dimensions (LxWxH) 16.0 x 15.0 x 13.0"
Can it use generic material or only XYZ material? This model is only compatible with XYZ filaments.